Mikhail Leontyevich Mil, founder and designer general of the Moscow Helicopter Plant, was born on November 22, 1909 in educated family. His father - Leonty Samoilovich Mil - was a railroad employee, and his mother was a dentist. Since childhood the future designer was interested in aviation. After completing the secondary school in 1926 he entered the Siberian Technological Institute in Tomsk. There he took optional training in gliding group with enthusiasm. But the Siberian Institute didn't train the aircraft engineers, that's why two years later Mil transferred to the third year of the Mechanical Faculty, the Don Polytechnical Institute, which offered specialised training in aviation. In 1922 he got married to P.G.Rudenko, who was in the same year at the Institute. They had five children - four daughters and a son. While a student Mil was interested in rotary-wing airborne vehicles and during his industrial practice in summer of 1929 he took part in building the first Russian autogyro, dubbed as KASKR. After finishing the Institute in 1931 the young engineer joined the Section of Special Constructions in Experimental Aerodynamic Department of Central Aero and Hydrodynamic Institute (CAHI). Before long he showed his worth as a promising expert. One year later, in January 1933, the Section of Special Constructions was reorganised into Department of Special Constrtuctions, and he became the head of the team, engaged in aerodynamic calculations and experimental research. Then his first works - descriptions of autogyros of CAHI - were published. His following publications were dedicated to aerodynamics and flight dynamics, aeroelasticity and strength of rotary-wing vehicles. General rotor theory, used for calculation of different streamlining types, was originated under Mil's guidance. By early 40s, Mikhail Mil became one of the leading home experts in autogyro and helicopter theory. He was not only a scientist, but an experienced designer as well. Mil made a design for A-12 high-speed autogyro and A-15 fire adjusting autogyro, he also designed blades and other units, made a close study of the features of autogyros with "jumping take-off capabilities. In 1940 Mil was appointed deputy chief designer of new helicopter plant �0. There only, under the guidance of N.I.Kamov, he was engaged in serial production of A-7-3A autogyros and took part in building the experimental AK "jumping" autogyro. In the beginning of the Great Patriotic War Mil was sent on an errand to the experimental squadron of fire adjusting autogyros, used in the battle near Smolensk. But before long the squadron was disbanded, and the plant �0 was evacuated and then closed. In 1943 Mikhail Mil returned to CAHI. But all work, connected with helicopters, has been already discontinued at the Institute. Mil continued research in aeroplane stability and controllability, commenced before the war. This research was used as the base for his Ph.D. dissertation, which he defended in 1943. Mil was decorated with the Order of Patriotic War, Second Class, and the Order of Red Star for his contribution to the development of aviation technique during the war. In 1945 Mil successfully defended his D.Sc. thesis on "Dynamics of rotor with hinged blade joint, applied to stability and controllability of autogyros and helicopters". After the end of Great Patriotic War it became possible to renew research in helicopter building in CAHI, and Mil starts to elaborate the experimental EG-1 helicopter. It was a three-seater of classic single-rotor design, featuring M-13 engine and original unit, which provided for automatic enhancement of flight stability. On April 9, 1946 the designer submitted the project for the approval of the expert commission from Ministry for Aviation Industry. The commission approved the project but recommended to introduce a number of alterations, so that domestic industry real abilities would be taken into account. Mil continues researching aerodynamic features of main rotors on the experimental units at CAHI. On February 17, 1947 the Director of the Institute issued the order on elaboration of the versatile testing stand, which was called "full-scale helicopter unit" (NGU). In fact it was the single-rotor helicopter, but without the facilities for parrying reactive moment of main rotor, without undercarriage and some other units. This NGU was elaborated in such a way, so that it would be possible to transform it into a real helicopter by introducing few alterations and adding tail and undercarriage. So the realisation of Mil's idea in many respects contributed to the establishment of the new design bureau for the development of the first Mi helicopter. On the 26 of March, 1947, by the order of CAHI's Head, on the basis of T-105 spin and vertical wind tunnel lab, there was established the Laboratory � aimed 搕o decide research problems of helicopter building and aeroplane spin". The lab consisted of two sections. Mil was appointed the head of the whole laboratory and of the helicopter section. Employees of that section, a little more than 20 strong, constituted the basis of future helicopter design bureau. None of them designed helicopters earlier. That's why from the very beginning Mikhail Leontyevich's authority was so implicit. During the first years of that design crew existence Mil always remained the highest instance, no matter what question of helicopter design arose, - be it arranging, parts design, calculation of aerodynamic or pilotage features. Considerable experience, gained before the war in autogyro design, was a great help to Mil in elaboration of his first helicopter. He had to defend his ideas in tough competition with authors of alternative projects. Interdepartmental Government Commission on defence industry considered a lot of helicopter projects then. New rising branch of aviation industry attracted more than one talent designer. Design bureaux of well-known I.P.Bratukhin and A.S.Yakovlev had been working in that area very successfully. These bureaux started to elaborate light helicopters at mid 40s. Fall of 1947 saw the approval of life-size model of EG-1 three-seat helicopter, built in 5th Lab at CAHI, by Government Commission under General-Major N.A.Zhemchuzhin. On December 12, 1947 the Council of Ministers of the USSR issued the resolution on setting up Mil experimental design bureau. Initially it was located in 5th Laboratory of CAHI in Zhukovsky as before. In July 1948 the Expert Commission of Aviation Industry Ministry under Professor I.V.Ostoslavski approved the project of EG-1, and the young team was granted the premises of the disbanded M.M.Pashinin design bureau. These premises were located on the territory of large assembly department of � aircraft-building plant in Tushino. The plant was founded on the basis of the factory re-evacuated during the war. In late 40s it was being converted from manufacturing light Yakovlev fighters to heavier two-engine Tu-2 bombers. The plant performed different orders as well, for instance, it was building trolleybuses. Initially the team, dubbed Experimental Design Bureau (EDB) � had rather tough relations with the authorities of the plant. The Ministry of Aviation Industry contemplated to develop the experimental helicopter building on the Moscow Plant � where Mil Design Bureau was supposed to be transferred to. But this small wood processing factory was already overpopulated by different institutions. Mil managed to convince Mr. M.V.Khrunichev, the Minister, to leave the Design Bureau in Tushino. After successfully completing the tests of the first light GM-1 (Mi-1) helicopter the Design Bureau was granted new convenient premises. By orders of the Minister - M.V.Khrunichev - the design team was expanded considerably. It started to elaborate new helicopters. But in 1951 they had to leave that attractive place on the bank of Moscow Channel. In spring the oldest Bratukhin helicopter Design Bureau was disbanded at the Plant �and the Ministry directed Mil to occupy the now vacant premises. Wood-processing factory was located on the outskirts of Sokolniki-park. Since the pre-war times it has been manufacturing packaging boxes and furniture. During the Great Patriotic War its workshops were affiliated to large Moscow Aviation Plant �1. Wooden parts of wings for Lavochkin fighters were manufactured there. Since the beginning of 1944 Bratukhin Experimental Design Bureau 3 was located on the territory of Plant �1. Its profile wasn't in line with the main profile of the Plant. So by the order of People's Commissar for Aviation Industry, dated 10 January, 1946, 揻or the sake of expanding experimental base and experimental works for helicopter building" EDB-3 has been transferred to 2nd Rybinskaya street. Since then the affiliated branch of Plant �1 became the main centre of domestic helicopter building. By the resolution of the Council of Ministers of the USSR, dated 29 September 1948, Experimental Plant �of the Ministry for Aviation Industry Ministry was established on the basis of the above affiliated branch. Its task was to "create new helicopters and their varieties". Besides Bratukhin Experimental Design Bureau, it housed Kamov EDB, as well as the specialised jet helicopter-building Design Group under Yu.L.Starinin, B.Ya.Zherebtsov and Yu.S.Braginsky. Besides that, there was the specialised design bureau for the aerodrome equipment. This bureau was manufacturing serial units for starting up. But at that time Soviet officials considered helicopter-building a minor, that's why the Plant authorities regarded the extension of aerodrome equipment manufacturing as important as building sample series of Mi-1 helicopter. When Mil Design Bureau shifted to the Plant �situation has changed drastically. Kamov EDB has shifted into vacated premises of EDB-4 in Tushino, and then the rest of the institutions have left the plant at 2nd Rybinskaya street too. After October 1951 Mil Design Bureau became a sole master of the plant, which was renamed into Plant �9 of Ministry for Aviation Industry in June 1953. Mil was appointed a Chief Designer and a plant manager. Yu.B.Eskin became a plant Director, V.A.Kuznetsov and N.V.Rusanovich became Deputy Chief Designers, G.V.Kozelkov became a Head of Experimental Design Bureau, N.N.Leontyev became a Chief Engineer, M.O.Paretsky became a Chief Expert in metals and Chief Technologist. D.T.Matitsky was in charge of flight testing station for a long time. His first aide was G.V.Remezov. After shifting to a new territory Mil's team was reinforced by experienced engineers and workers from Plant � A number of employees from other industries joined Mil's team too. Since 1953 those who completed studies at the Helicopter Division of Aeroplane-Building Faculty of Moscow Aviation Institute began to join the enterprise. Plant "inherited" the flight testing station in Izmailovo from Bratukhin Design Bureau but soon an aerodrome there began to be built over with blocks of flats and all following flight-tests were carried out at Zakharkovo-aerodrome in Tushino. Flight testing station, mounting section and few other auxiliary production services were originally located in large hangar belonging to the special squadron of the Ministry for Aviation Industry, but after a while new premises and rotor blade section have been fitted out at the aerodrome itself. Own experimental-manufacturing and flight-testing bases provided for creating new modifications of Mi-1 helicopter, but their serial production continued to be postponed. The attitude of the Ministry for Aviation Industry towards the emerging branch changed drastically after the Government enactment, dated October 1951, which envisaged expanding helicopter-building. Mi-1 helicopters were manufactured at the plants in Kazan, Orenburg, Rostov-on-Don and Svidnik (Poland). Serial manufacturing of helicopters in Poland started from Mi-1. Considerable assistance in organising helicopter serial production at those plants was rendered by Mil's team. State support to the experimental helicopter plant increased considerably after the plant had received the order for building Mi-4 multipurpose helicopter, and Mi-6 heavy transport. Old production buildings of the Plant �9 have been completely reconstructed, besides the firm was granted additional neighbouring territories. Thus the manufacturing area increased almost twicefold. New housing projects were launched. During 50s first prototypes of Mi-4 multi-purpose helicopter, Mi-6 heavy transport helicopter and Mi-10 flying crane were designed and built at the Plant �9. Large scale production of those helicopters started in Kazan and Rostov-on-Don. It promoted establishing affiliated branches of Mil's Experimental Design Bureau in those towns. The affiliated branches dealt with lapping and upgrading serial machines and elaborating their modifications. Helicopter serial production in China started from manufacturing the Mi-4 at Harbin Aviation Plant. Late 50s saw the construction of V-7 unique experimental helicopter with main rotor, jet driven by turbojets on blade-ends. Design particulars of rotary-wing airborne vehicles, which sometimes didn't have analogues in world practice, required the elaboration of own methods of units and systems design. With Mil's direct participation, A.E.Malahovsky, a talented designer, has laid foundations of 搊wn� school for main rotor design. Mil's follower, M.A.Leykand was in charge of bush design. Engineers A.M.Grodzinsky and V.V.Grigoryev designed structural arrangements of main rotor blades. A.K.Kotikov and V.T.Koretsky designed helicopter reducing gears and transmissions. I.S.Dmitriyev was in charge of control systems design. M.P.Andriashev supervised elaboration of fuselage design for Mi helicopters. Despite acknowledgement of successes of young helicopter plant, industry leaders treated the Experimental Design Bureau �9 as a poor relative, when it came to scientific and experimental maintenance. Therefore Mil's team had to master the methods of analytic research and the technique of carrying out complicated ground-based and flight tests. Plant �9 team had to organise own research and development base. In collaboration with CAHI, Central Aeroengine Institute (CAEI) and Flight Testing Institute (FTI) Mil's team carried out theoretical, research and experimental work. Chief designer personally placed himself in charge of helicopter aerodynamics and dynamics research. He was assisted by his true follower - engineer A.S.Braverman. In Experimental Design Bureau �9 they purified methods of aerodynamic computation and computation of pilotage characteristics, developed methods of computation of frequency characteristics, loads and stresses in rotor blades. Under the supervision of L.N.Grodko and A.V.Nekrasov Mil's theory of helicopter strength was being formed. Mil's team has gained much successes in solving the problems of ensuring construction dynamic strength, eliminating rotor and rudder propeller flutter as well as ground and air-borne resonance, reducing the vibration level. They pioneered introduction of tensometering to experimental research and methods of computation using fast computers. In March 1957 scientists and designers of the firm had organised the first scientific and technical conference on the problems of helicopter-building, leading domestic experts from Experimental Design Bureaux, research institutes, serial plants and exploiting organisations took part in this conference. So by the end of 50s Mil's school of scientific design and development, acknowledged and highly appreciated by experts of domestic and foreign helicopter-building, has taken its shape in Experimental Design Bureau �9. Different forms of encouraging employees' creative work were used at the Bureau. Mikhail Leontyevich always respected the opinions of highly qualified scientists and designers of the firm. He mixed with young experts, guarded each of them himself, spared much time for training new generation of qualified experts in computing, designers and helicopter test-fliers. Mil was an enthusiast in his favourite business. He was noted for being possessed with his work and could infect others with his own example. Thanks to Mil's personal qualities his serried team members were very friendly to each other. There was an atmosphere of intellectuality and high culture. Years of intensive work have brought success and world-wide fame to Mil's firm. Its helicopters won most of world records, especially in loading capacity. The team successfully developed new helicopter constructions and aviation technologies. By early 60s the creation of Mi-4 multi-purpose helicopter and then the creation of Mi-6 and Mi-10 helicopters strengthened the reputation of Plant �9 and its manager in national aviation industry. By that time chief designer has intended to develop the range of different kinds of helicopters from smallest to heaviest. But existing functioning production capacities in Sokolniki and Zakharkovo aerodrome were inadequate for the realisation of his ideas. Building new production and laboratory complexes on those territories wasn't planned, because the Government intended to expand Moscow borders and building industrial enterprises wasn't encouraged. It was possible to build small Mi-2 helicopter but larger prototypes of the Mi-8 had to be built, in compliance with the agreement, at the aviation Plant � in Fili. At that time N.S.Khrushchev disbanded Ministries and instituted Councils for National Economy. Therefore it was difficulty to collaborate with serial plants for prototype building. Mil's team had to solve the acute problem of expanding their enterprise. State Committee for Aviation Engineering (Ministry for Aviation Industry) offered to Mil either to shift Experimental Design Bureau as well as production and testing facilities to fully equipped premises of Plant � in Fili or to build own design and production base anew at Panki railway station near Lyubertsy-town on the grounds of former aviation wood store-houses. The first proposal was clearly more attractive, but the manager was afraid that it would be difficult to retain the largest aviation plant for a long time . That's why Mil's team chose 搘ood store-house". On the 30th of May the Council of Ministers issued an enactment on building a new complex of State Plant �9 in Panki. This complex included not only Experimental Design Bureau buildings, experimental production and testing facilities, but also living quarters and consumer services. Taking into account the situation in the country, Mil succeeded to arrange the building of the completely independent small town with own boiler-house, water-supply, electric power station etc. In front of the gates of large assembly section for large helicopters there was development area - big enough for new prototypes taking-off and landing. Despite his being very busy, Mil paid much attention to the construction of the new plant, all projects had to get his personal approval. At that time the management staff was renewed. At 1959 J.B.Eskin retired and Mil began to act as director. N.N.Leontyev was appointed deputy production manager. In 1961 S.A.Kolupayev became chief engineer. Besides N.G.Rusanovich, V.A.Kuznetsov and G.V.Kozelkov, Mil has appointed V.P.Lapisov, an experienced manager, and A.V.Nekrasov, a young world famed scientist and expert in helicopter strength, as deputy chief designers. 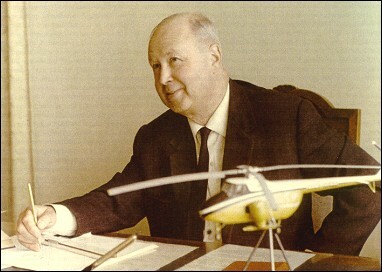 In late 60s rotor designer M.A.Leykand and expert in aerodynamics M.N.Tishchenko were appointed deputy chief designers. G.V.Remezov was appointed acting deputy chief designer.